People trapped in the Old City of Mosul are dying of hunger because they have not received any food for almost three weeks according to a resident. In an exclusive interview with The Independent, Karim, a 28-year-old taxi driver who lives in the ancient centre of Mosul, says that many people, including several he knows, one of them a friend, have already died of malnutrition. Karim’s account, given over a weak mobile telephone link to east Mosul, throws light on what is happening in the Old City, a warren of narrow alleyways and ancient houses which is crammed with people and still largely controlled by Isis. Aid agencies estimate that there are 400,000 people living here and a further 200,000 on the outer periphery whose status in terms of food and safety has hitherto been unknown. People are unable to escape to areas already captured by Iraqi government forces and join the tens of thousands fleeing south away from the fighting. These board blue and white buses that take them to camps at Hamam Alil where they are vetted to detect Isis members, fed, receive medical attention and housed in tents. Karim gives a vivid picture of the confusion and terror in Old City, with its narrow alleyways where no vehicle can go, makes it ideal terrain for Isis’s style of urban guerrilla warfare. Isis squads of half a dozen or more fighters, including highly experienced snipers and bomb makers, slip from house to house through holes in the walls. Surprisingly, Karim says there are not many Isis fighters in the southern part of the Old City, but the army has not yet entered the area. Isis fighters are under intense pressure from air attack and ground forces that far outnumber them. They have managed to hold back Iraqi Federal Police and other units on the southern periphery of the Old City, inflicting heavy casualties. The Iraqi government does not reveal its losses, but General Joseph Votel, the head of US Central Command, says that Iraqi forces have lost 284 killed and 1,600 wounded so far in their bid to capture west Mosul that started on 19 February, compared to 490 killed and 3,000 wounded in its successful three month-long battle for east Mosul. Civilian loss of life is not known. 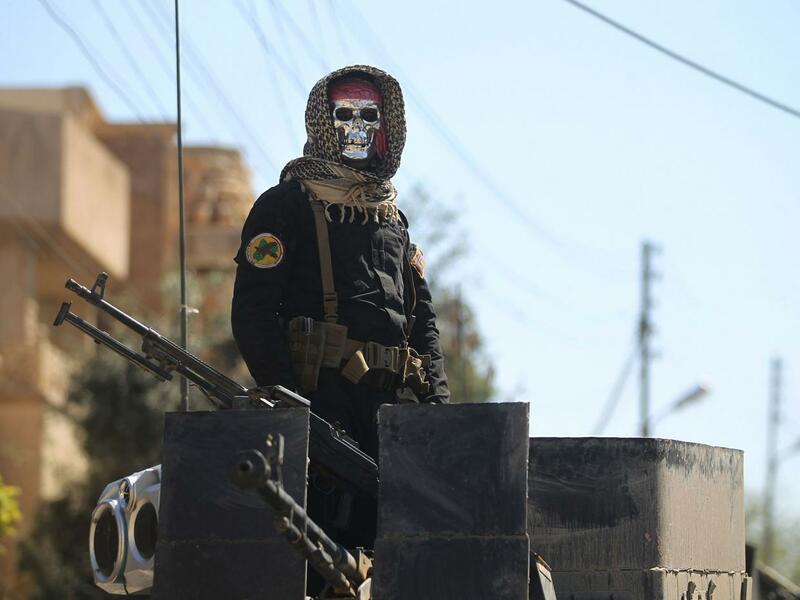 Iraqi government forces have changed their tactics and Isis is now being attacked by the so-called Golden Division, a specially trained 10,000-strong elite unit attacking the Old City from the west. The plan is evidently to make multiple attacks on Isis, which has an estimated total of between 3,000 and 4,000 fighters in Mosul, to spread them out and make it easier for assault teams to penetrate into the Old City. Everywhere in and around those parts of west Mosul held by Isis, perhaps a quarter of the city as a whole, remain highly dangerous where a simple mistake can have lethal consequences. Earlier this week, a 33-year-old taxi driver called Jasim made just such a mistake which almost cost him his life as it led to his house being targeted by a drone. By his account, three weeks ago the Iraqi military had told people in Mosul not to cover their car or property with canvas or any other material or they would be targeted by drones or aircraft. The reason apparently was that Iraqi officers, or American special forces that are also calling in air strikes, believed that Isis was using these materials to hide weapons and munitions. People in government-held east Mosul were told about this and asked to inform their relatives and friends in the west, if they could reach them by phone. Unfortunately for Jasim, he misunderstood the point and thought the warning only applied to canvas covering cars and also forgot that there was a piece of canvas covering one part of the roof of his house. Saudis oppose new U.S. stance on Assad. Where to do the French and British stand? On Wednesday, Haley accused Russia, Iran and the "Assad regime" of committing war crimes. She has also said the United States supports the U.N.-led Syria peace talks, that Syria could no longer be a "safe haven for terrorists" and that it was important "we get Iran and their proxies out." It does mean that the Trump Administration is now officially set on a collision course with the faction that controls the U.N.-led peace talks, no matter what Haley says about supporting them. From Sputnik's March 30 report, Saudi-Backed Syrian Opposition Remains Adamant "Assad Must Go"
The High Negotiations Committee (HNC) backed by Saudi Arabia strongly believes Syrian President Bashar Assad should not play a role in Syria’s future, Monzer Makhous, a member of the opposition group, said Thursday. "Our position remains unchanged, Assad must go," Makhous told reporters at a press briefing in Geneva, Switzerland. Speaking alongside Makhous, HNC member Fatah al-Atassi said the Committee believed Assad should not be on Syria’s future transitional government and questioned the reasoning behind Tillerson’s statement. Syrian opposition member Farah al-Atassi said the State Department and the White House were sending contradictory messages on Syria and should start leading and not focus exclusively on fighting Islamic State. Britain and France reinforced their stance on Assad earlier on Thursday. French U.N. Ambassador Francois Delattre told reporters: "Assad is not and cannot be the future of his country." The UK accepts that Bashar al-Assad should be allowed to run for re-election in the event of a peace settlement in Syria, Boris Johnson has said, in a dramatic reversal of the British policy stretching back to the early days of the civil war that the president must go. Speaking on the eve of Theresa May’s meeting with Donald Trump in Washington, the UK’s foreign secretary acknowledged that the inauguration of the new US president meant all sides needed to rethink their approach to Syria. “It is our view that Bashar al-Assad should go, it’s been our longstanding position. But we are open-minded about how that happens and the timescale on which that happens,” Johnson told the Lords international relations select committee. The official Foreign Office view has long been that Assad can stay only for a short period as part of a transitional government. In the days after he was appointed as foreign secretary in July last year, Johnson insisted that Assad had to go. But the defeat of the rebel opposition in Aleppo, Trump’s determination to rebuild relations with Russia, and the Turkish rapprochement with Moscow has changed the equation. “We have been wedded for a long time to the mantra that Assad must go, and we have not been able at any stage to make that happen, and that has produced the difficulty we now face,” Johnson said. That also leads me to wonder about the statement from the French envoy that Reuters quoted. Saying that Assad "is not and cannot" be the future of Syria isn't necessarily continuing to call for his immediate ouster. Given that the French presidential election is very soon it could be that Amb. Delattre's remark yesterday just represented diplomatic treading of water. We'll know soon enough exactly where the French and British governments now stand regarding Assad. The big question is whether they'd be prepared to stand in outright opposition to the House of Saud. The photo shows Syrian peace talks at the UN Palace of Nations in Geneva on March 29 between Saudi-controlled High Negotiations Committee (HNC) delegation, which terms itself the main opposition to the Syrian government; the UN Special Envoy for Syria Staffan de Mistura and his delegation; and a Russian delegation, including my favorite envoy, Deputy Foreign Minister Gennady Gatilov, who always manages an almost supernatural calm while he's enduring blasts of hot air. Oh wait; that meeting was for de Mistura and ambassadors to the five permanent members of the UN Security Council. The March 2017 meeting at the UN palace was just for a bunch of mercenaries in the pay of Al Saud, which, I might add, also has to foot the bills for hotel and meals for that lot during negotiations. Just a cup of cappuccino costs an arm and a leg in Geneva except at the Palace of Nations cafes, so the Saudis probably make the HNC delegation eat there. So did they get anything accomplished during this, the fifth round of the Geneva Process talks? Let's hope, or the sixth round will be meeting in the Palace of Nations garage. 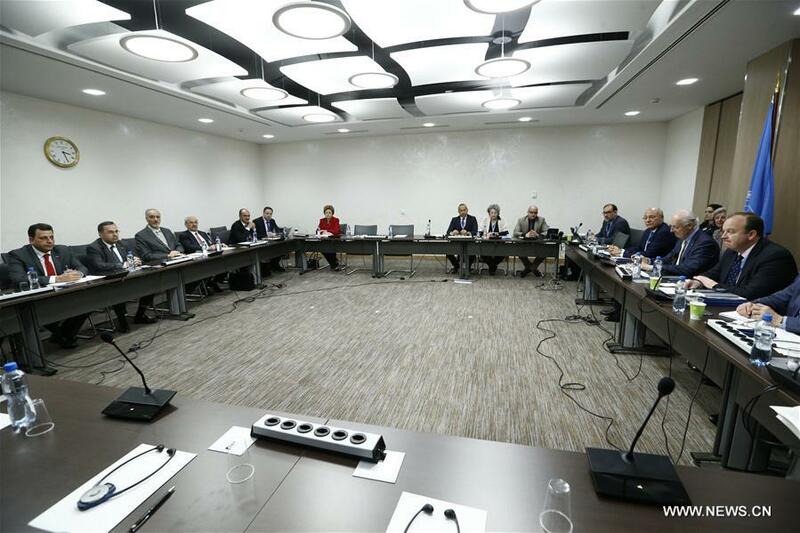 GENEVA – A Russian delegation and High Negotiations Committee of the Syrian Opposition (HNC) on Wednesday (March 29) both reflected positively on their direct meetings as the fifth round of the UN-backed Syria peace talks entered into its sixth day. Speaking after their one-hour meeting, Russian Deputy Foreign Minister Gennady Gatilov and the Syrian opposition said they hope this round of negotiations can make progress to ensure that peace talks can continue in the future. 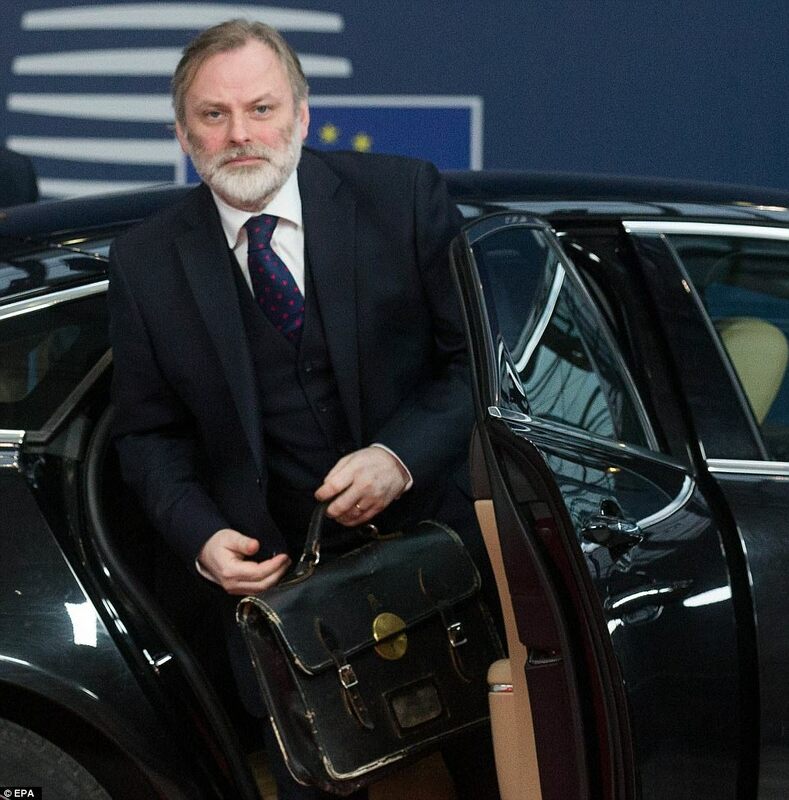 "We had a very open exchange of views on the current stage of the negotiations. 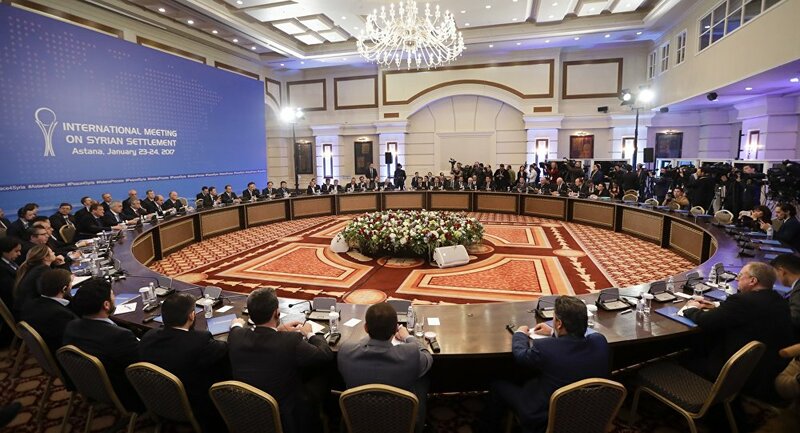 And we came to the common conclusion that we would be very much in favor of having good development this round and continuation of discussions, in order to reach the goal of independent territorial integrity in Syria, a pluralistic state and all of these questions should be decided by the Syrians themselves in the course of the negotiations," said Gennady Gatilov. The HNC said the meeting with Russia centered on Syria's political process and humanitarian aid. The HNC said it stressed its concern about the progress made in this area. It also handed its proposals for a transition of power and schedule of elections to Staffan de Mistura. "We believe that these talks have been very positive. Russia also expressed its will in holding such discussions to promote the ongoing Geneva talks in the future. Russia said the next round of Astana talks will be held in the first week of May, which on this occasion is making preparations for the political progress made here in Geneva," said Salem al-Meslet, HNC spokesman. Okay, they agreed to hold more talks. I'll mark that as a successful negotiation. But I can't wait for the talks in Astana and I'll bet the HNC can't either. Remember the conference room there? Now that's a conference room. "The Decisive War of Democracies" is the title given to the podcast of Gregory Copley's discussion on the Tuesday John Batchelor Show. Listen if you want to appreciate more about the growing conflict between anti-national elites who control the world's most powerful urban centers and those who support national sovereignty. Will the conflict morph into open warfare -- and even an apocalyptic war, as top Trump advisor Steve Bannon clearly sees on the horizon? I'm betting it won't, for the same reason I eventually abandoned the theory of a doomsday virus. The counter-theory is based on the fact that the more hosts a highly infectious and deadly virus infects, the more chances for the virus to "reassort" with other, less-deadly viruses infecting the same hosts. These reassortments tend to produce a less virulent strain of the deadly virus. I think this is a key consideration in an era of avian, human, and animal megapopulations. In an almost poetic twist, the bane of humanity -- 'overpopulation' -- might well be our best defense against a doomsday virus in an era of globalized air travel, which within hours can deposit a highly lethal virus all around the world. An inadvertently funny accusation was mounted recently by a group that totted up 200 Western media outlets it claimed were either outright supporting Russia or didn't realize they were Russian dupes. I exclaimed in amusement, "Only 200?" There are surely thousands if not tens of thousands of Western blogs and other media outlets that can be considered Russia friendly, if one takes into account that Russia has become the bastion of Westphalian thinking. There are now so many of these media outlets that the idea of accusing them all of being Russian agents or dupes belongs in a Looney-Tune cartoon. One casualty of this situation has been David Cameron, who seemed to view all the land between London and Doha as flyover country. Another casualty last year was the American Democratic Party, which viewed all land between New York City and Los Angeles as flyover country. Which is to say that unlike earlier eras, when a relatively small number of people periodically warred against urban elites who'd gotten too big for their britches, today there are vast numbers in rebellion, and they are distributed throughout societies, across the world. The surprise Brexit "yes" vote, as with the surprise election of Donald Trump, are but two of the many indications of the huge number of such people and their diversity. 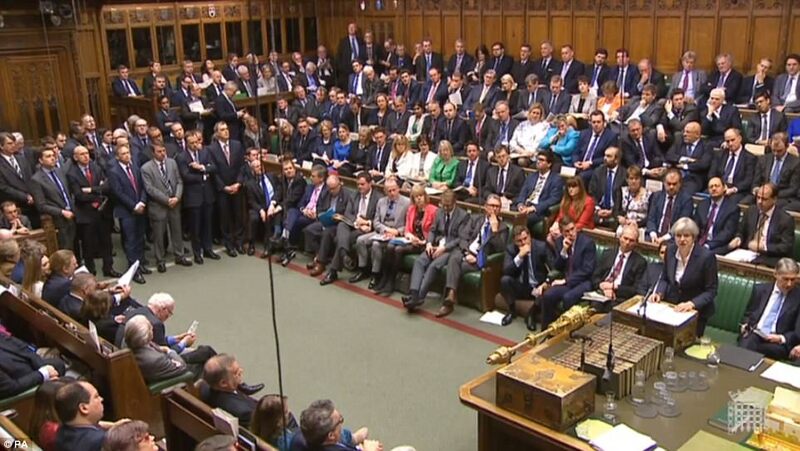 That the mainstream media and political pollsters have ignored these vast numbers of people, or portrayed them as bumpkins, or didn't even perceive their existence until the two surprise votes, has nothing to do with the reality of their size. So I think that the simple fact of megapopulations in this era works against the traditionally 'closed shops' controlled by the kind of elites who touched off, say, World War I in the name of a phony nationalism. Those elites were fighting to maintain their own power not protect national boundaries or the masses, who were considered too uneducated to be of use other than as cannon fodder. Today's masses are increasingly well educated, and don't take to dying on a battlefield for an illogical argument. What could be more illogical than arguing on the one hand that only jingoists support nationalism, while on the other urging people to sign up to defend their nation? "Winning's everything. If you don't win, you can't make the public policy. ... Wherever there's a disagreement among Republicans, I'm for one of those disagreements. I'm all for it. The president's with Russia? I'm with John McCain and Lindsey Graham, I'm for NATO! Why? (It's a) wedge. Wedges have to be schisms, schisms have to be divides." That's from Democrat Rahm Emanuel, who's never lost an election. Are the Democratic Party bosses listening to him? Rahm is one of the party bosses. Yes, they've been listening. The EU's chief negotiator Michel Barnier is preparing to present the UK with a £50 billion bill and is arguing that it should be settled before other issues are considered. If Britain is allowed to get a good deal, other countries contemplating their own departures could speed toward the exit. Yes. If the British get an easy divorce, Mon Dieu! France might decide to be France again, and then the whole European project goes to hell. Will the British "Remainers" and their backers in Brussels find a way to get around Article 50 now that it's been triggered? Stay tuned and bring popcorn. Meanwhile, in honor of the day, I'm going to listen to Sayonara. Karla Adam in London, Michael Birnbaum in Brussels and Brian Murphy in Washington contributed to this report. Robert Fisk presents his report on the evacuation as a highly dramatic literary piece (see below). SANA, Syria's state information agency, presents a report on the same event that is long on bare facts and short on drama. Both versions are helpful to understanding the significance -- and technical aspects -- of the evacuation. Because it's shorter than Fisk's report I'll start with SANA's version, datelined March 27, which features a prosaic photograph of the evacuation (shown above). And note SANA's prosaic labeling of these cutthroats as "gunmen" [smiling] Well, the government is very generous toward those Syrians who want to stop fighting. Homs, SANA – More than 500 gunmen and some of their family members on Monday left al-Wa’er neighborhood in Homs city and headed for the northeastern countryside of Aleppo. The evacuation of the second batch came within the framework of the reconciliation agreement which aims to evacuate all gunmen and weapons from the neighborhood and pave the way for the return of all state-owned institutions to it. In a statement to SANA, Homs Governor Talal al-Barazi noted that the reconciliation agreement is being implemented according the set program which extends between 6 to 8 weeks, adding that the third batch of gunmen who reject to join the agreement will leave next Saturday. He said that more than 600 persons have settled their legal status in the last week, including 120 gunmen. 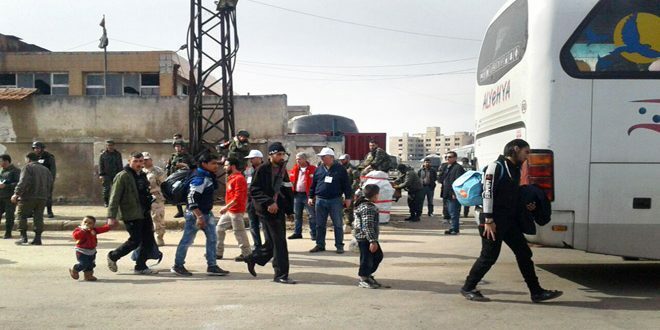 Head of Homs Health Directorate, Hassan al-Jendi said that a medical team has been prepared to provide vaccine to children in addition to a clinic to provide citizens, who are leaving the neighborhood, with healthcare services. On March 18th, 423 gunmen, who rejected to follow the reconciliation agreement and 1056 members of their families left the neighborhood, while the legal status of hundreds of persons had been settled according to the amnesty decree No. 15 for 2016. They came out of the dawn. Young men dressed and scarved in black and carrying Kalashnikovs, old men in wheelchairs, mothers in midnight niqabs, a teenager with a child in one arm and a strapped rifle draped over the other, a serious man with a big gold and green Koran in his right hand and a small figure with a vast shaggy beard, the very last Che Guevara, walking and limping and sometimes marching almost nonchalantly onto the buses. They came from the very last rebel enclave in Homs. And they were, some of them, going to fight another day. They didn’t look at us. They didn’t look at the Russian soldiers or the Syrian troops or the policemen or the plain clothes Syrian cops or the Red Crescent women; they didn’t bother to glance at the cameras that whirred and clicked their faces off to posterity; not that you could see many of the women behind their face covers and black scarves as they climbed slowly onto the buses. But one young man in a red and white track suit who glowered towards us, turned back once he was on the bus, behind the safety of the window. And he grinned and put his right finger in the air above his head and turned it round and round for his audience on the street outside. "We are coming back," it said. We are not leaving. We are not surrendering. But of course, no-one had asked these hundreds of men and women to surrender. Months of negotiations and trust and a lot of suspicion are slowly emptying the withered, smashed suburb of al-Wa’er of its armed men. Al-Wa’er means a barren place, a place without flowers, a place where nothing grows. So what might grow after this exodus of people – Syrians for the most part, although one man must have been a Sudanese and Che Guevara looked as though he was probably a Saudi – and what peace might it bring to central Syria? All were sent in their fleets of buses north to Jerablus on the Turkish border where the Syrian government hopes, without saying so, that they will seep across into Turkey and never return. But that wasn’t what the governor of Homs was telling them. He walked to the buses and pleaded with the departing thousands to stay. You will be safe, he told them. You can stay in your homes. You will not be arrested. There was a middle-aged man with a limp who sported a sniper’s rifle, burly men with shoulder bags whose contents we could only guess at and so many more young mothers and children, some who looked unwell, and babies who must have been born under siege. The Russians watched impassively, tall, well-fed soldiers in flak jackets and steel helmets, guarding the lives of ferociously opposed enemies – the militiamen emerging from the slums and the Syrian troops watching them leave for the far north. Colonel Sergei Druzon of the Russian army looked on like a little Zhukov. This may not have been a military victory for Moscow – but by heavens it was a political victory for the Russians to have taken over the role of UN peacekeepers – if only for a day – on the Syrian front line. But epic dramas like this need subjectivity as well as cynical truth. Within two days, 160 fighters had reportedly chosen to stay in a new government-controlled al-Waer, laying down their weapons and choosing to trust the government they have fought. Another 215 men and women, including 50 fighters, chose to leave. A further 450 were to join them. The figures climbed throughout the day. But what was so striking was the normality of it all – maybe "naturalness" gets closer to the feeling – because here were lethal enemies, the armed groups of al-Wa’er (Nusrah/al-Qaeda among them) and the Syrian army and special forces who had fought and killed each other and whose monstrous war still consumes Syria, standing only 15 metres apart, scarcely even bothering to look at each other. At first, it was all very self-conscious. The Syrians eyed the crowds and especially the gunmen among them, desperate to believe their promises of safe conduct and allowed to carry their small arms and rifles. But the "rebels" – and here the quotation marks are necessary because there were at least 15 different versions of them – tried to look casual, almost bored, as if it was the most tiresome thing in the world to abandon your home (or at least your battleground) and sidle past your enemies to try a new life elsewhere. Then came the defiant ones. Instead of carrying their weapons in their left hands, between themselves and the buses where the cameras couldn’t snap their guns, they made their way through the tapered columns with their AKs in their right hand, happy to be seen with them although often virtually masked by black scarves, defiant rather than defeated. And then, after a couple of hours, they would approach the front of their queues with a vague curiosity. They looked at the Syrian soldiers with a faint interest. So THIS was the enemy, their eyes said. But they said nothing. No-one offered a word. No one spoke or prayed or cried – for many were leaving their homes, perhaps forever – and save for the roar of the buses and the Syrian jets which daggered meaningfully through the skies overhead (and surely this was a message from the government), not a sound came from these hundreds of men and women. If this was Hollywood – and none could deny the drama – it was a largely silent movie. Maybe there should have been a piano in the background or a list of captions to tell the audience what the actors were thinking. But all we got were dozens of tourist buses, advertising Syrian tours around a country which no sane person would or could tour, save for those boarding these very same buses for the north. There were a few named characters in this theatre. There was, for example, the imam in his long gown who walked from the departing masses whose name was Sheikh Attalah and who shook the hands of the mufti of Homs, Sheikh Issam al-Musri, who came to greet him from the government side. Al-Musri pleaded with his friend to stay in Homs, not to board the buses. Attalah – and his words were almost inaudible -- spoke of a decision taken 24 hours earlier to leave. The word went round that he spoke of a "fatwa" issued by some authority (unknown) that threatened anyone who stayed with death. But there was no confirmation of this. There had been bitter disagreement between the "rebel" groups. Some wanted to go to Idlib to join their comrades there. Others opted for the Turkish border. Colonel Druzon admitted there had been much debate about the destination of the buses. The rows between competing armed groups had already caused long delays in the departure programme, which will continue again next week. And what of those who will nonetheless make their way to the big killer zone of Idlib? Will they, too, be bombed once more, even by the air force comrades of the Russian soldiers protecting them on the edge of al-Wa'er? Mr al-Barazi – and you cannot fault the man’s optimism – said that many would still remain, that 150 had agreed to stay in the past two days, that everyone, the religious leaders, including the Christian clergy, had added their names to their guarantees of safety. But then, looking at those black-clad figures with their guns and children and niqabed wives, would you, reader, trust yourself – if you were them, heavens above -- to the regime you had been trying to destroy for more than six years? War crimes have been committed across this poor country by every side – and no-one has yet dared to produce a figure for the hundreds of kidnap victims in Homs (yes, again, by both sides) since the start of this war. And so they continued to walk up the red and white tapes towards the buses. Many looked poor and they had the plastic suitcases and zipper-bags of the poor and the children had clothes that were either too pink or two green and who looked as if no-one had combed their hair for many days. They weren’t all like this. There were a few dapper shoes, some niqab-chic and a man faithfully clutching a satellite dish. Perhaps he wanted, up in Jerablus, to plug it in and view his own exodus. “One by one,” an armed Syrian policemen said loudly to several departing gunmen, and they waited and kept their patience and walked obediently to the buses. But this was the saddest departure, for most of the hundreds who queued to leave were not foreigners and this portended further dispossession and pain and loss and the young man who indicated that he would return meant what he said and he didn’t intend to come back without his gun. Alas, it was the same old story. The Syrians were on the move again. Greece begins blocking refugees but faces "austerical despair"
"Of course, should Greece really go against Merkel’s dream of assimilation, she will simply unleash further austerical despair on the nation in return for their next bailout." 4 regions make up largest humanitarian disaster in more than 70 years. Now what? "Somalia's emergency is joined by similar hunger crises in South Sudan, northeastern Nigeria and Yemen, which together make the world's largest humanitarian disaster in more than 70 years, according to U.N. officials." "The UN is seeking $4.4-billion by the end of March to prevent a catastrophe in South Sudan and three other famine-threatened countries: Yemen, Somalia and Nigeria. Yet by February, only 2 per cent of this target had been raised." All right. I'll outline each case one by one. But the first question is how in the hell did this happen, given the vast amounts of aid poured into these regions for decades? The answer: In all four cases violent conflicts are making bad situations worse; pile on top governments that don't work well in the modern era, traditional ways of life that don't square with the present climate in worst-hit regions and helped exhaust the land, and much misspent aid/development loans combined with stupid and corrupt officials and religious leaders. So why save these people? Many are born permanently brain-damaged because of severe malnutrition in the womb. They grow up physically and mentally stunted and not much use for anything but breeding like rabbits and plying a pastoral or farming way of life that their part of the world can't support in this era. First because if the better-off societies can save this sorry lot they can learn to save anybody, including themselves. That represents a vital mastery of hideously complicated survival skills for a not-too-distant future. Amazing but true the disaster aid industry that arose in the post-WW2 era is getting better at problem-solving as it goes along. They are learning from past mistakes. Second, and related to the first reason, is that the name of the human survival game is becoming "stay in place" to whatever extent can be done. This because we're learning that too many times when we cut and run, the desert wins. Granted, often there's no choice but to run; e.g., when a vital water source completely dries up. But modern technologies and the accumulation of millennia of knowledge now give humanity a slight edge in the unending struggle against the desert's march. The idea now is to put all that technology and knowledge to use in the worst-hit regions. No guarantee of success in every instance but the fight is worth it. So what we're seeing today is a sea change in the entire approach to disaster aid. Just as medicine is focusing more on prevention, so aid strategies are trying to prevent the worst of conditions that spiral into disasters. This approach does have drawbacks; for starters, it can make it even easier for governments that want to meddle in a country's politics to do such. This has been a perennial problem, especially since the Cold War. Another drawback is that extended aid done without changes to a country's basic situation helps support the situation. But this is not a perfect world. And so the race is on to ward off the kind of famine that between 2010 and 2012 wiped out about 260,000 Somalis. Humanitarian aid workers learned many lessons from the disaster and now they're trying to apply what they learned to avert the looming one. The race to save Somalis, however, is up against the hard deadline of April. The rains in Somalia have failed two years in a row; if they fail next month. The cholera epidemic is most prevalent among women and children. Cholera outbreaks often occur in refugee camps due to overcrowding and poor sanitation. Water scarcity also remains a major problem among the new arrivals in the refugee camps. In recent weeks, aid agencies have started a cholera vaccination campaign across Somalia. Somalia's drought is threatening 3 million lives, according to the U.N. In recent months, aid agencies have been scaling up their efforts, but they say more support is urgently needed to prevent the crisis from worsening. More aid "is very important if we want to prevent the cholera from going out of control and also to prevent famine. We have to get the funding now to prevent it," Steven Lauwerier, UNICEF's representative for Somalia, said standing inside a Baidoa hospital ward. "We are still ahead of the curve of the famine because now is when we can save lives," he said. "This is not the time to have doubts that funding is not needed." Somalia's emergency is joined by similar hunger crises in South Sudan, northeastern Nigeria and Yemen, which together make the world's largest humanitarian disaster in more than 70 years, according to U.N. officials. In Somalia, drought-stricken families have had to move from one place to another in order to reach international aid agencies that cannot distribute food in areas under the control of al-Shabab, Somalia's homegrown Islamic extremist rebels who are affiliated with al-Qaida. Captains of small wooden dhows are carrying food and wares from the United Arab Emirates to war-torn Yemen. But supplies are falling even from this centuries-old Arabian sea route that is one of the last lifelines to a country on the brink of famine. A two-year-old civil war has severely restricted the flow of food into the main Yemeni cargo ports of Hodeidah and Salif on the Red Sea, where all the large grain silos are located. The small wooden boats sailing from souks in the UAE are moving small but vital supplies by making for the smaller ports to the south coast that are of little use to larger vessels – and often sidestepping military inspections that choke traffic by dropping anchor at secluded coves nearby. The deals originate in the sprawling Al Ras Market, a collection of dusty alleyways near the Dubai Creek where an array of food and spices are on display including colourful sacks of Pakistani and Indian rice. The dhows – plying the ancient trade route that once carried the likes of pearls, frankincense and myrrh – supply 14,000 to 18,000 tonnes of foodstuffs a month to Yemen, according to traders. That represents a drop of about 30-40 percent over the past year because of problems with payment, as well as adverse sailing conditions. The volumes of food carried on this route represent a small fraction of the supply to Yemen, which relies on imports for 90 percent of its food. But it has become increasingly important as fighting has raged, the economy has collapsed and Yemen has needed all the help it can get. The conflict has choked imports. Sixty percent of Yemenis, or 17 million people, are in “crisis” or “emergency” food situations, according to the United Nations. While vessels seeking access to Houthi-held areas must face inspections for smuggled weapons, the government-controlled south has less restrictions. Food imports into Hodeidah have fallen relentlessly, with only a few ships arriving each week – compared with dozens before the war – and more shipping lines pulling out due to the growing risks, according to aid and shipping sources. In recent weeks damage to infrastructure in the neighbouring port of Salif has also cut food deliveries, aid officials said. "The country is living on its reserves…There is a lack of liquidity, no payment of salaries, which means that the spending power has collapsed and that the price of food is soaring whenever it is available." UAE-based dhow captains avoid these snarl-ups by steering clear of the big Red Sea ports and instead ply their trade to the south, often docking at informal inlets. The average journey takes about five to eight days, with the boats capable of taking up to 2,000 tonnes of goods, still small fry compared with cargo ships that could provide more relief to one of the poorest and most unstable countries in the world. Trader Ali Mahdani ships his goods out of Dubai to the southern Yemeni ports of Aden, Mukalla or Mokha, goods worth 4-6 million UAE dirhams ($1.1-1.6 million) per month, around 2,000 tonnes of mostly rice, spices or cooking oil. To avoid payments in the battered Yemeni currency he gets paid in Saudi riyals. There are few issues upon arrival. That’s a sharp contrast the scrutiny that any vessels hoping to access the north would be subjected to as the Saudi-led coalition search for weapons which may be headed into Houthi hands. “You may have to pay thugs every once in a while but otherwise it is all good to go,” said Mahdani, dressed in a flowing white robe. See also Yemen wheat stocks to run out end of March. The reproach came two days after the United Nations warned that more than five million victims of Boko Haram face serious food shortages in the coming year. “A projected 5.1 million people will face serious food shortages as the conflict and risk of unexploded improvised devices prevented farmers planting for the third year in a row, causing a major food crisis,” the U.N. Deputy Humanitarian Coordinator, Peter Lundberg, said in a statement Friday. Mr. Lundberg’s alert followed a similar one issued by a sister agency, UNICEF, in September. UNICEF, which focuses on humanitarian assistance for children and mothers, said more than two million people remained trapped in Boko Haram-controlled areas while about 400,000 children were at risk of acute malnutrition. The agency said more than half of the children could die within 12 months unless urgent measures were taken by the concerned authorities. Given that the UN and the entire disaster-aid industry are always dialing for dollars, there could be some truth in Buhari's accusation. But from the UN side they're not so much exaggerating as trying to get ahead of a disaster -- to ward it off before it kills hundreds of thousands of people and millions of livestock. This was a problem in Somalia in 2010-12; by the time a famine was declared large numbers of people and livestock had already died. And it takes time to set up the pipelines to deliver disaster aid, which translates to many more lives lost during the wait. To return to Buhari's side of the debate, there is a problem he didn't go into during the public statements but it is very serious, and this is the merging of disaster aid and development aid, or putting the latter in the disaster budget column. And further, attempts by donor nations to change a society in fundamental ways that masquerade as disaster aid, which can be hard to pin down. That last is what I thought I heard from the mouth of a U.S. Deputy UN Ambassador, Michele Sison, who was interviewed by Voice of America for a March 15 video report about conditions in N.E. Nigeria. Watch the video for yourself but what I heard was talk about protecting the rights of women; e.g., when they went outside the refugee camps. If VOA hadn't cut her off I feared she would've maintained that Nigerians' recognition of LGBT rights was critical to preventing starvation in their northeast region. It's possible I'm being too hard on her but just to be clear, there has to be a bright line between development and disaster aid. And an even brighter line between disaster aid and programs that introduce your cultural values to other societies. There is much criticism of rich Muslim Arabs who use disaster situations in Africa and other parts to build more mosques there and send in more Wahhabist clerics. But this is the pot calling the kettle black if the critics are trying to tie disaster aid to their own cultural preferences. And it leads to just the kind of "Cry Wolf!" situation that Buhari complains about. While acknowledging a decline in socio-economic activities of the people of north-east, Mr. Buhari said his administration is making efforts to resolve the crisis and improve the living conditions there. “There can be no doubt that the effect of the Boko Haram terrorism and their occupation of communities and destruction of houses, infrastructure and means of livelihood has been manifested in the decline of socio-economic activities throughout the North-East. “Arising from this, farming, pastoralism, trade, exchange of goods and services and social interaction among the people have negatively been impacted leading to the displacement of more than two million people, mostly women and children. Consequently, there is death, there is hunger and there is poor nutrition. “The Nigerian government which has been making the most efforts in the entire endeavour, will continue to work closely with the local and international response groups to overcome this humanitarian crisis. At this time when the focus is gradually shifting to towards rehabilitation, reconstruction, resettlement, recovery and the dignified return of IDPs back home, we can do with all the support out there in the donor community,” the statement said. But in the interim, the president warned that humanitarian agencies should desist from continuing to blow the situation out of proportion for financial gratification. When I add this to what the UN says, I'm seeing a humanitarian crisis that is near the edge of a disaster emergency, but with enough hands on deck to prevent the worst -- provided the present situation with Boko Haram doesn't worsen. So it seems there's a big military component to alleviating the situation for civilians, just as there is in Yemen. The revelation is so disturbing that it might once have shocked the world into action: the mounting evidence that an oil-rich regime is using the brutal tactic of deliberate starvation to crush a revolt by its own citizens. Yet as famine and death spread in the world’s newest country, there is little sign of any urgent response by the world’s most powerful leaders. Instead there are growing fears that political apathy and U.S. budget cuts will make the catastrophe even worse. The man-made disaster is unfolding with relentless momentum in South Sudan, where three years of civil war have brought famine and forced nearly two-thirds of its 11 million people to depend on humanitarian aid. At least 79 aid workers have been killed since the war began, including six killed on Saturday in an ambush in government-controlled territory. The famine, declared last month, is the first anywhere in the world in nearly six years. South Sudan is now one of four countries where 20 million people are on the brink of famine – one of the world’s worst humanitarian crises since the Second World War. Less than six years ago, the United States and Canada were among the many nations celebrating South Sudan’s hard-fought independence from the Sudanese dictatorship. With its oil wealth and strong Western support, South Sudan seemed to have a bright future. Instead it has collapsed into deadly anarchy, with repeated warnings that it could be on the verge of genocide. Tens of thousands of civilians have died. Half of the government’s budget is reportedly being spent on weapons and soldiers for the war. And now the government is using its chokehold on relief supply routes to starve its opponents and control the impoverished population. United Nations officials have reported that South Sudanese soldiers are blocking the roads into regions where aid is desperately needed, demanding money and forcing dozens of relief convoys to turn back, and sometimes even attacking the convoys. In effect, the regime is using food blockades as a weapon of war, at a time when 100,000 people are officially in famine and another million are on the brink of famine. Because so many roads are blocked or dangerous, the UN has been forced to drop its food aid from airplanes flying above the malnourished regions, at a far higher cost than land routes. A leaked UN report has concluded that the famine in South Sudan is largely due to the “cumulative toll” of government military operations and restrictions on relief operations. The famine, unsurprisingly, is in an opposition-controlled region. “The government’s continued unconscionable impediments to humanitarians … may amount to deliberate starvation tactics,” said Michele Sison, the U.S. deputy representative to the United Nations, at a Security Council meeting last Thursday. At the same Security Council meeting, UN Secretary-General Antonio Guterres said the government is refusing even to acknowledge the existence of the crisis. The disaster is so devastating that South Sudan has become the world’s fastest-growing refugee crisis, with 1.6 million of its people fleeing across borders into Uganda and other countries. The UN is seeking $4.4-billion by the end of March to prevent a catastrophe in South Sudan and three other famine-threatened countries: Yemen, Somalia and Nigeria. Yet by February, only 2 per cent of this target had been raised. The Canadian government this month announced $119.25-million (Canadian) in humanitarian aid for the four famine-threatened countries, and other countries are beginning to chip in. But the UN’s food agency, the World Food Programme, has been so underfinanced for years that it has had to cut rations to refugees and other recipients. At the same time, U.S. President Donald Trump is proposing sharp cuts to foreign aid, including UN agencies. The United States is traditionally the biggest donor to UN relief operations, so the cuts could have a far-reaching effect. The cuts wouldn’t take effect until next year, even if they are confirmed by Congress, but they are sparking fears that the South Sudan crisis could accelerate in the longer term, with less global support. Now let me see if I understand this correctly. After outside governments poured God Only Knows how much assistance into splitting Sudan into two countries, a great many people in the new country didn't like the new government, setting off a civil war, with one result being that the government of the new country turns out to be as nasty as the one in Khartoum. And so, if the cost of dealing with the four crises is evenly split four ways, more or less, the UN now wants the Trump Administration to have a heart and okay about $1 billion to help alleviate a famine in South Sudan that is the result of said ongoing war and civil unrest. Is that the gist, or have I missed something? If that is the gist, and the conflict is open-ended, how long is the $1 billion supposed to last in alleviating the ongoing famine? If they're going to die anyway after the billion runs out, why spend the billion in the first place? Or does the UN envision coming back in 6 months and asking for another billion? Then another? So I wouldn't put South Sudan in the category of a humanitarian crisis or disaster emergency; it's just the way the country is until things change there. If you want to see a change then you'd first have to get a list of all the nations that are buying oil from Juba, the seat of South Sudan's government, and tell them to stop buying or else you'll slap sanctions on their governments. With oil purchases suspended, then see if Juba wants to block aid delivery routes and charge $10K/aid worker permit. But if those oil-buying nations happen to include U.S. allies and trading partners? Well, I'm the same person who replied, "Bomb Riyadh. Bomb London. Bomb Rawalpindi," when some fool asked me in 2010 how the US could achieve victory over the Afghan Taliban. I was overstating to make a point. Most people want to act foolishly and have the situation work out intelligently anyway.